The Hing mango pickle is rarely found in a store, but is a staple in every home in Eastern Uttar Pradesh, India. Raw mangoes pickled in salt and asafetida, allowed to cook in the hot May sun, makes it a long shelf life food, and lasts a whole year or more. Most gardens in old bunglaws still have a mango tree or two, even in cities like Lucknow or Varanasi. Even as these mango trees attract the Koel or Indian cuckoo, kids, squirrels, bees, butterflies and birds love the tree just as much. In an Ayurvedic thaali, this pickle contributes one of the six tastes, the sour. Hing mango pickle requires no artificial preservative. I loved using this pickle in a stir fry. Yield: Serves 4 people as a side dish with rice, roti or combined with pasta. Nutrition Facts: Brinjal or Aubergine is rich in Calcium and Phosphorus. Carrot is rich in beta-carotene, Vitamin A, B-complex groups of vitamins such as Folic acid, Vitamin B-6 (Pyridoxine), Thiamin, Pantothenic acid, antioxidant Falcarinol, Copper, Calcium, Potassium, Manganese and Phosphorus. Potato is rich in starch, soluble and insoluble fibre, B-complex group of vitamins such as pyridoxine (vitamin B6), thiamin, niacin, pantothenic acid and folates, Iron, Manganese, Magnesium, Phosphorous, Copper and Potassium, antioxidant Quercetin, and Vitamin C if the skin is used. Sesame seeds are rich in mono-unsaturated fatty acid, Oleic acid, antioxidant Sesamol and Sesaminol, amino acids, Calcium, iron, manganese, zinc, magnesium, selenium, and copper, B-complex vitamins such as niacin, folic acid, thiamin (vitamin B1), pyridoxine (vitamin B6), and riboflavin. Garlic is a great source of Allicin, Potassium, Iron, Calcium, Magnesium, Manganese, Zinc, and Selenium, anti-oxidants like beta-carotene, zea-xanthin, Vitamin B-6 and Vitamin-C. In a deep wok (Indian kadhai) heat the oil and add pepper powder, potatoes and garlic. 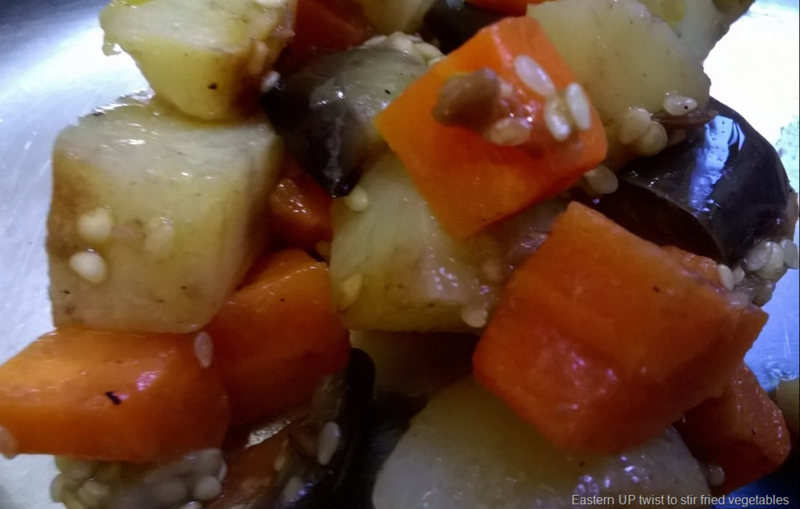 Cook them for a minute and add the carrots and aubergine. Stir fry for 2 minutes. Add the sesame seeds, salt and Hing mango pickle. MIx well. Cover and cook on low heat till the flavours blend and the potatoes are soft and ready to eat. Serve hot with rice (white, red, wild, basmati, mansoori, shakar chini, kala namak or joha with a dollop of butter or clarified ghee. ), Indian flatbread (roti) or combine with pasta for a wholesome meal. You can wind up with some of these desserts… Karaunda jelly, Chocolate cake, Guava toffee, Sewain or sugar free Sesame laddoo.